"The green movement is growing in Napa just as it as around the country. I, personally, don't believe it is a 'trend' but more like an evolution in our thinking." In recent years, the words "green" and "organic" have become common vernacular in wine communities across the United States. And, as home to more than 300 wineries, the Napa Valley's leading role comes as no surprise. Nearly ten percent of Napa's wineries are already certified organic or Biodynamic, many others await certification (a three-year process), and a vast number more are incorporating some sustainable practices. But why are these methods important to the consumer, and what specifically do they entail? Here's a brief rundown on the newest eco-friendly terms spoken with earnest in the Napa Valley. Simply put, a wine is considered organic if it is made from 100% certified organic grapes and contains no sulfite additives, although up to a hundred parts per million of sulfur dioxide--a natural fermentation byproduct-are permitted by the USDA. The organic philosophy, however, is more extensive than the certification suggests. From the organic view, pesticides, herbicides, chemical fertilizers, and growth regulators cause long-term damage to the soil, hinder the natural processes that produce the grapes' natural flavor, and, rather more to the point, end up in the wine we buy. Reducing chemical additives, exercising proper crop rotation, and naturally maintaining the soil are a few ways in which organic farmers seek to sustain and rejuvenate the environment while producing higher quality wine. Organic wineries may take steps to emulate a natural environment, allowing other plants to grow in their vineyards to maintain the soil's mineral balance. Promoting biodiversity can reduce or even eliminate use of pesticides, as the cover crops attract predatory insects and spiders. Wineries like Domaine Carneros have purchased equipment for controlling weeds and thereby replacing harmful herbicides. Domaine Carneros became California's first sparkling winery to receive organic certification in April 2008 after beginning its first forays into organic farming ten years ago. Take the practicality of the organic philosophy, infuse it with a spiritual reverence for the farming land, add in some mysticism--and behold a grossly simplified version of Biodynamic agriculture. Founded by Rudolf Steiner in 1924, Biodynamic agriculture has found its way into the modern wine culture of the Napa Valley by way of Grgich Hills Estate in Rutherford. Such wineries perceive the soil and the farm as living, individual organisms. They share the organic school's disdain for chemical additives; Grgich Hills fertilizes its vines with compost to promote humus development and hopes its methods will allow the plants to better regulate their own nitrogen, water, and sun intake. Perhaps the most intriguing practice, Biodynamic preparations are fashioned from plant and animal materials and placed in the growing fields. Six of the nine preparations create compost, horsetail is sprayed as an antifungal, and manure and silica are buried in cow horns and left to decompose. Meanwhile, farming is carried out in rhythm with cosmic forces as an astronomical calendar provides a schedule of planetary alignment. As unconventional as this all may sound, its five-year development at Grgich Hills impressed enough to warrant a total Biodynamic conversion: 366 acres in all. Something of an umbrella term for farming practices incorporating natural energy, non-chemical, and other eco-friendly alternatives, sustainable farming shares long-term goals of environmental balance with organic and Biodynamic philosophies. At Keenan Winery, a switch to solar power last year made sense businesswise as well as environmentally. Keenan's solar shift will reportedly shear an annual 37 tons of carbon dioxide from his winery's output. Many others are following in kind. 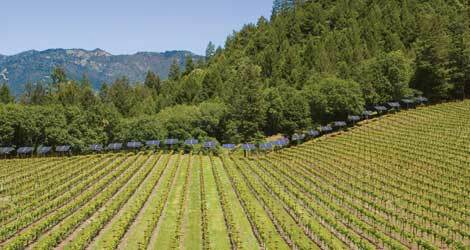 Fosters Wine Estates reports a move to solar power in all of its California wineries. Fellow Napa winery Trefethen Family Vineyards has diligently pursued its own sustainable ambitions, while wind power and biofuels are providing winemakers across the country with easy green alternatives. Environmentally conscious winemakers seem to agree: The costs of going green are well worth the yield. These practices have already repaid us with vibrant crops and phenomenal wines; the reward of permanence is still to come. As these methods develop and enter the mainstream, we can expect to witness their use in the Napa Valley and across the nation.